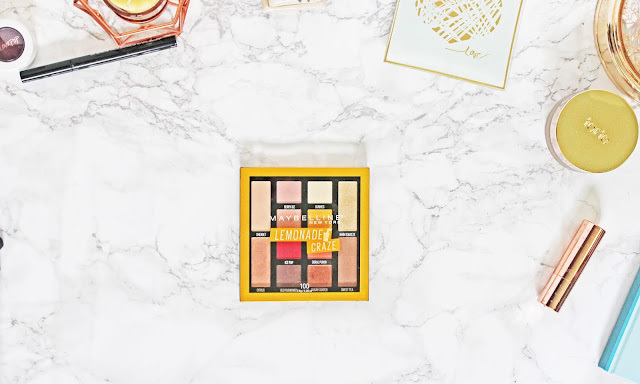 A pretty popular thing with the beauty girls on YouTube is videos on how they pack their beauty products or what products they pack. I am in Myrtle Beach SC right now and just started a new way of packing my beauty products. I thought I would share how I’m packing my beauty products because I just love it! It’s so much more organized than my previous way of packing. I am going to do a post on what products I packed on Sunday. Hold onto your seats for that one. It might me a long one. So back to how I pack. Before, I used to put all my makeup in a shoe box and my full size shampoo & conditioner, my full sized body wash, and my hair and skin care products into an old purse. I’d then put the old purse and shoe box into a book bag with my hairbrush, hair dryer and flat iron. It was very unorganized and everything kept falling over. The full side bottles were too big and took up to much room. Everything would fall over and/or end up up-side-down. I was so scared it was all going to spill out. And I didn’t even really have anything to put my nail stuff in. I just threw that stuff in my purse. I finally have bags for makeup, bath & hair stuff, nail stuff and a nicer big bag to put it all in. So let’s get talk about the bags. I love them so much. I’ll do a quick review of each. I have two of these bags for my makeup. I know, why do you need two? 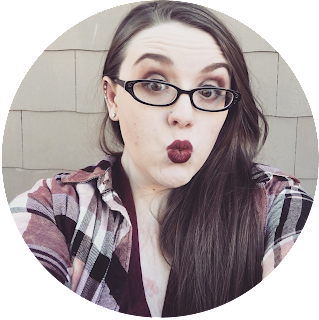 I love my lippies and take quite a few of them. And most of my eyeshadows are singles. I use one for Lippies, eyeshadow, and other eye things, and the other bag for face base, cheek, and other makeup things. 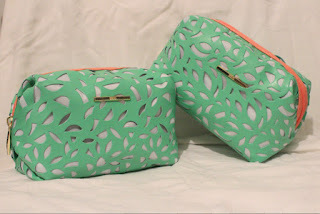 Both bags have a teal lace like cut-out design over a white base with a coral pink zipper. These are the box shaped type of bags. I love them! There is so much room in them! They are so well made. And they hold their shape really well. 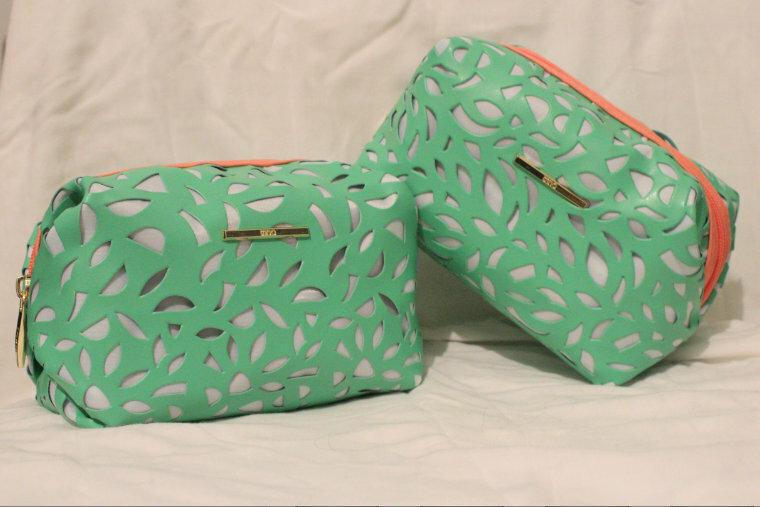 I love these makeup bags so much! Amazing quality for only $15 at Ulta! 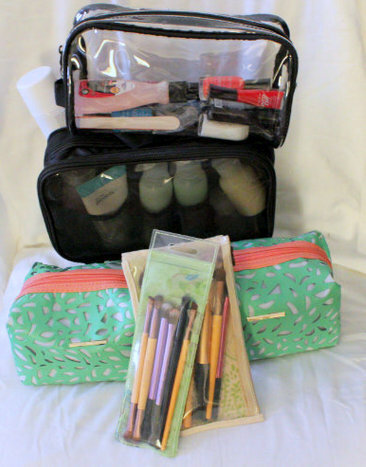 I love to use the brush bags Eco Tools brushes come in. I have one normal sized off white one and one skinny green one. I put my eye brushes in the green one and all my other brushes in the off white one. I love these brush bags! I got this bag from Wal-mart. It came with 2 bottles, a net luffa, and a toothbrush case. I already had iGo bottles from Walmart that are $0.97 each so I haven’t used the bottles and I don’t go near luffas. They are the perfect place for mold, mildew, and bacteria to live and grow. I love the bag! And if you haven’t got travel bottles the ones in this kit are cute little ones that are great for a week trip. I just already had bottles. I may use the bottles and the toothbrush cover sometime in the future or give them to my mom. As I said I love the bag. It has a mesh front zip pocket for your travel bottles which fits all of my bottles, both travel and original, perfectly. And the second pocket is great for my skin and hair care products. Everything fits and I’m not worried about spilling. I love this bag! The little guy in the front pocket of the bag that holds all of your bottles comes out and can hang in the shower or off of a rail in the bathroom. I love this little guy. I love this bag! It is the standard travel size for planes so I can use this when I fly too. I use this bag for my nail stuff for normal travel. It fits all the polishes I wanted to bring, my Sally Hansen base & top coat, nail files, nail polish remover, etc. I love it! I got 2 snap cap bottles, one squeezy bottle, and a travel soap dish. There were only $0.97 each! I got the 2 snap bottles for shampoo & conditioner, the squeezy bottle for body wash, and the soap dish for q-tips. The soap dish is perfect for a good handful of q-tips. You can take them with you and they won’t get dirty and gross. I love the iGo travel line! I wish they had more stuff in the line. They have lots of colors. Clear, hot pink, green, blue, yellow, and white frosted. I got them all in frosted. I love it. The bottles and toothbrush cover in the Basics Kit are also frosted, which I love. I really love this line and wish they had more travel gear. really like it as my beauty bag because of its size but it really isn’t worth $99. It is about 24 inches long and about 12 inches tall. It fits all of my beauty things x2. Since I got it for free and actually have a use for it is pretty good. But since it’s from VS it should be better quality. This is the big bag I put everything else in. I put the makeup bags, shower bag, nail bag, my hair brush, hair dryer, and hair straightener into this bag and I’m good to go. It all fits great and could fit more. I love the new way I pack my beauty stuff. And I really liked sharing it with you. I’ve had something like this in my head for a long time and now I have it. Or something close to it. I think I like this way better. I love organizing things and like I said I’ve been planning this type of travel beauty set up for awhile. About 2 years actually. I’m so happy to finally have the travel set up I wanted and to share it with you. If you have any questions or concerns feel free to message me. If you liked this post or topic let me know in the comments below. Much Love!